Graduate Students! Check Out These Sessions & Events! Please join us for our fifth annual dine around event! We’ll meet in the Hyatt Atrium on Wednesday night at 6:00pm and walk to local eateries for dinner. You’ll meet fellow SWPACA attendees and area chairs. What better way to start our conference than with excellent conversation and tasty Albuquerque cuisine! This event will feature a performance and discussion from a Native hip hop artist. A discussion of various rap and hip hop songs, requested by attendees, will also be part of this hip hop appreciation event. Whyte: Join us for the Seventh Annual Graduate Student Breakfast, hosted by the SWPACA Executive Team. All graduate and undergraduate students are welcome to attend; bring a friend, enjoy a light breakfast, and network with other emerging scholars. For the fifth year in a row, we will get our “geek on” in style for our annual SWPACA GAME NIGHT! The hosts of this session are expert geeks and will provide some fun, challenging, but easy-to-learn games that are anything but traditional, including European games of the year and Mensa award winners. Multiple tables will be available, so the more the merrier. Snacks will also be provided. Come out and enjoy an evening of camaraderie with your fellow conference attendees! Come join our Executive Staff as we celebrate the 40th annual meeting of the Southwest Popular/American Culture Association. Hosted by the Hyatt Regency Hotel to honor our conference attendees, light refreshments, beverages, and celebratory birthday cake will be available. 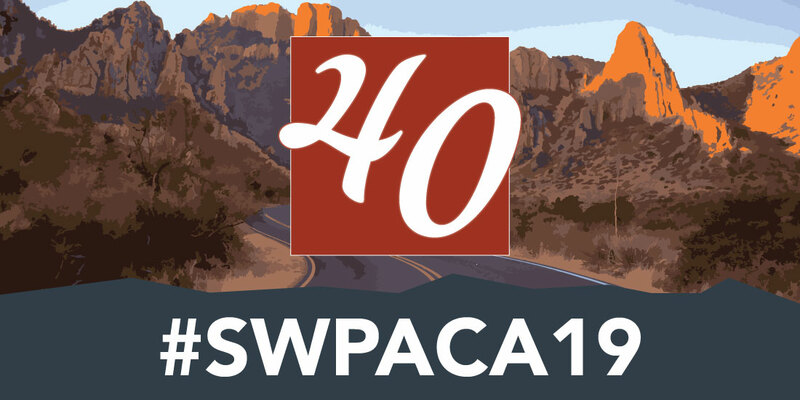 The Southwest Popular/American Culture Association is pleased to welcome Pam Houston as the Keynote Speaker for the 40th annual SWPACA conference. Houston is the author of is the author of the short story collections Cowboys Are My Weakness and Waltzing the Cat, among others, as well as the recently released non-fiction work Deep Creek. Book signing to follow the Keynote Address. Houston will focus on what she believes to be the real artistry of prose writing: the way we dip our ladles into the bottomless pot of metaphor soup of our lived and witnessed experience and pull out what we need; the way we pick up hunks of the physical world and bring them back to the page, translated into language. Please comem armed with pen, paper, or laptop, your vast memory banks, your active and engaged senses, and all the things you don’t even know you know. 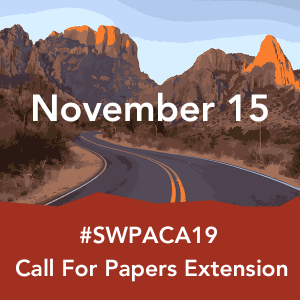 Join the Southwest Executive Team as we revist the highlights of 2019 and plan for SWPACA 2020! Join representatives from McFarland and recent authors for a discussion regarding academic publishing in popular culture. Going on the market? Already been on the market? Tired of the market? The job market is shrinking, and many of us find that we need to diversify our skills. In this session, join faculty, professionals, and graduate students for a discussion about the job market and information about resources for the job search. Note that this is not a typical panel session with formal presentations; audience members are invited to share ideas, resources, and advice with one another to get a better understanding of how to prepare for and conduct both academic and alt-ac job searches. Join publishing representatives, journal editors, and scholarly authors for a panel and discussion on publishing. A Question and Answer session will be included. From revised dissertations to senior scholars’ latest books, memoirs and novels to guidebooks, university presses are an important part of the publishing world but can seem difficult to navigate. Elise McHugh, senior acquisitions editor at the University of New Mexico Press, will demystify the process of what UNM Press and university presses in general are looking for, how to submit your proposal, and what to expect when working with an academic publisher. This workshop will demystify general academic publishing practices and provide insider insight into publishing protocol. Advice on how to identify opportunities, the best way to approach a press, and how to deal with peer reviewer feedback will all be discussed. Highlights include essential tips and strategies as well as the common pitfalls to avoid when engaging with book or journal editors. This session is useful for both veteran scholars as well as those new to academic publishing. Amy Damutz, who handles North American acquisitions and marketing for Intellect Ltd, will host the session. Casual format with plenty of Q & A to follow. Stephen Ryan, Senior Editor for Rowman & Littlefield presents “Moving Beyond the Academic Market: Turning a Monograph Project into a Reference Volume or General Interest Book.” During this session, Stephen will discuss how to shape a monograph project into a reference work or general interest title that will appeal to public libraries. The Southwest Popular/American Culture Association is pleased to announce that Pam Houston will be the Conference Keynote Speaker for the 40th annual Southwest Popular/American Culture Association conference, held at the Hyatt in Albuquerque, New Mexico, February 20-23, 2019. Houston is the author of the novels Contents May Have Shifted and Sight Hound, the short story collections Cowboys Are My Weakness and Waltzing the Cat, and A Little More About Me, a collection of essays, as well as the forthcoming non-fiction work Deep Creek. The Conference Keynote address will be held on Friday February 22, 2019. After the keynote, Houston will be available for a book signing for Deep Creek, which will also be available to purchase. For more information on Houston, please download the official press release for Deep Creek, and visit her author page on Facebook.